This Is Getting Old: Johnny on the Spot! After a shaky start from goaltender Marc-Andre Fleury, Brent Johnson made every save thrown at him to help the Penguins to a 5-4 overtime win over the Rangers Thursday night at Madison Square Garden. 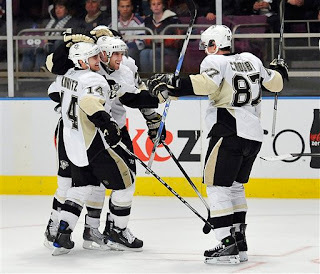 Jordan Staal had two deflection goals, including the overtime game winner to lead the Pens to victory. Chris Kunitz started the scoring for the Pens with a rebound powerplay goal 6 minutes into the first period. After that came Staal's first goal tipped in off a Matt Cooke wrister to take a 2-1 lead, but Chris Drury of the Rangers answered 5 minutes later with a wrap around from his knees to beat Fleury and tie the game up. In the second the Rangers scored two "soft" goals off Fleury, but they would be their last points of the game as Brent Johnson came in and was perfect. Mike Rupp also scored a huge momentum swinging goal off a center ice pass from Sidney Crosby to cut the defecit to 1 to end the period. Only one goal was scored in the third, but it was a big one as Alex Goligoski deflected a shot from the corner off of the skate of Marc Staal. His brother Jordan then scored the powerplay overtime winner deflecting an Evgeni Malkin slapshot in to give the Pens two points and move them ahead of the idle Devils in their division. To Fleury's defense, however, he had been sitting idle for the entire Olympics and was "rusty." The Rangers goals were scored by Artem Anismov, Drury, Michal Rozival, and Brandon Dubinsky. The Pens next play Saturday against the Dallas Stars.